The Lowa Combat boots waterproof. These Boots are a Military specification and comes with a Gore-Tex lining sock. This design has years of experience in design and manufacture behind it. The lowa combat boot is waterproof tactical boot and has been a favorite with the military for as long as i can remember and i have been selling lowa boots for over 25 years. It comes withe the famous fit and toughness for that difficult terrain. The combat boot has a little extra length on the boot to give added support on the ankles and foot. This is helpful in really rugged and awkward terrain.This is a very practical boot that will take plenty of punishment,is durable and is easy to clean. All the modern foot design is put into this boot to make sure it is capable of performing at the highest level.Lowa combat boots are for anyone in the armed services ,police or for those who wants a top class boot. Sizes 3 - 5.5 are female styles, Large sizes 14 and 15 are wide fitting boots. 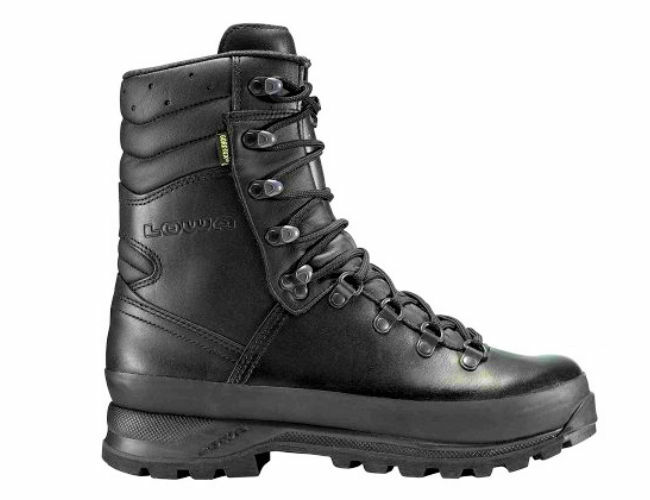 The Lowa police boots Low Mountain are waterproof and great for any terrain . Lowa recommends for the boots. It should be done every 6 months and with give new life to your boots. LOWA Active Cream Neutral.The neutral coloured maintenance cream designed by by LOWA for Gore Tex and Leather boots.It will caring for the boots and add waterproofing and still let the boots breathe.